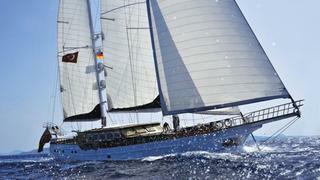 Miriam Cain at Camper & Nicholsons tells me of a €1.4 million drop in price of Charles Ehrardt's central listing, the 34m motorsailor yacht Blue Eyes. Built by Pax Navi in 2007 and designed by Erkin Yagcy and Erkan Ozhan, this gulet-style yacht incorporates large deck areas and a spacious saloon. She offers accommodation for up to 10 guests in a full-width master suite and four double guest cabins, all with ensuite bathrooms. Blue Eyes is now down from €4.9 million to €3.5 million.